Havertown 4-year-old Scarlett Camburn developed acute flaccid myelitis in 2016 and needed surgery to correct paralysis in her right arm. 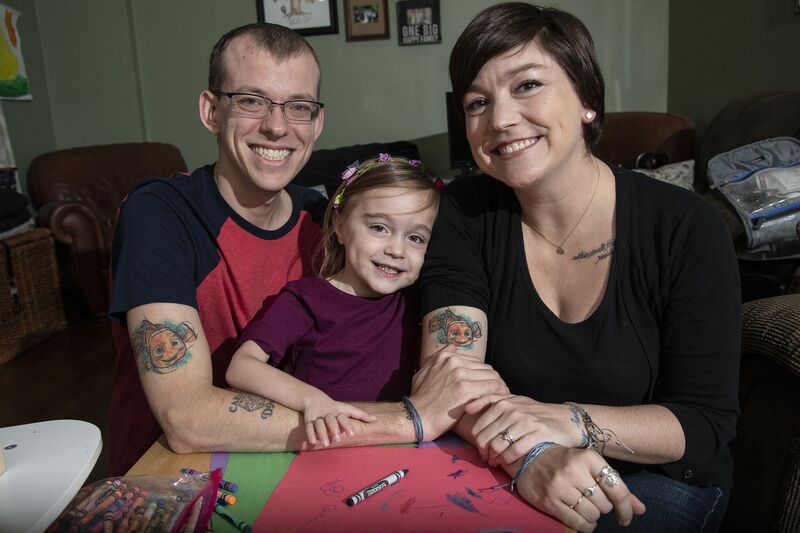 Her parents, Andrea and Chris, got matching Nemo tattoos because the Disney character’s lucky right fin is small and weak. Acute flaccid myelitis, a rare, polio-like condition marked by muscle weakness and paralysis in the limbs, has been confirmed in 10 additional patients this year, bringing the national total to 90 patients in 27 states. That update came Tuesday afternoon from Nancy Messonnier, director of the National Center for Immunization and Respiratory Diseases at the U.S. Centers for Disease Control and Prevention. Eight such cases have been identified in Pennsylvania this year, and four have been confirmed in New Jersey. A polio-like illness is on the rise again. But why? Physicians tracking the disease are fairly certain that most cases were caused by a type of virus called enterovirus D68. But the virus can be difficult to detect in patients, and Messonnier said the agency remained open to considering other possible causes. "As a mom, I know what it's like to be scared for your child," Messonnier said. "I understand that parents want answers. CDC is a science-driven agency. Right now, the science doesn't give us an answer." The condition has been confirmed in 414 people since August 2014, almost all of them children. Most are between the ages of 2 and 8. Most experienced a fever or respiratory symptoms from three to 10 days before the onset of muscle weakness, Messonnier said. The D68 virus has been identified in the spinal fluid of just a few patients with acute flaccid myelitis (AFM) — a clear-cut indicator that the virus caused muscle symptoms in those patients, she said. More of the 414 children have been found to have that virus in their nasal secretions, but Messonnier said that was not proof that the virus had caused the muscle symptoms. Most children infected with the virus suffer no muscle weakness — only runny noses and fevers, or no symptoms at all. "At this time of year, lots of kids have fever and respiratory infections," she said. "What we don't know is what's triggering AFM." Still, academic researchers think D68 and a related pathogen, A71, are responsible for most cases in which muscle symptoms occur. Among the evidence: University of Colorado researchers have injected the D68 virus into mice and induced paralysis similar to what is suffered in humans. In both mice and humans, the muscle symptoms are caused by inflammation and damage to the spinal cord. Roughly half the people with AFM have recovered from their symptoms, though some require surgery in which nerves are rerouted from an undamaged portion of the spinal cord to regain use of their arms. Children's Hospital of Philadelphia and Shriners Hospital for Children in Philadelphia both have performed such procedures on children with AFM. Messonnier said the CDC is not yet tracking the long-term outcomes of all 414 patients but is in the process of changing that. "It's something that we are working to correct," she said. Health departments and hospitals are not legally required to report the disease.